Cheer, shout and be wowed at the Capital One Orange Bowl Football Game featuring a team from the Atlantic Coastal Conference (ACC) and the highest ranked available team from the Big 10 or Southeastern Conference (SEC), or Notre Dame. The Capital One Orange Bowl is one of Miami's most cherished sports traditions, bringing together thousands of fans from South Florida and around the country to witness one of the most exciting matchups in college football each year. Most years, the Orange Bowl game features a team from the Atlantic Coastal Conference (ACC) and the highest ranked available team from the Big 10 or Southeastern Conference (SEC), or Notre Dame. 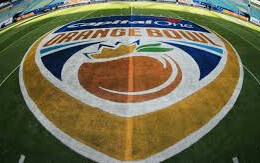 As part of the College Football Playoff rotation, the Orange Bowl also serves as a host site for a playoff semifinal game every three years. The Orange Bowl will host a playoff game in 2018, 2021 and 2024. Played at the end of December or the beginning of January, the Orange Bowl gives fans an opportunity to escape frigid cold temperatures and enjoy Miami's tropical weather, beaches, nightlife and much more. Since the first Orange Bowl game was played in 1935, the game has featured some of the most important college football games and brought some of the best college football players in the country to South Florida. It is the second oldest bowl game in the nation  only the Rose Bowl in Pasadena, California, has been around longer. The Orange Bowl has crowned the national champion in thrilling fashion in years past  including the memorable 1984 Orange Bowl, when Miami upset Nebraska to win its first national championship. That game is still regarded as one of the greatest college football games ever played. The game has also featured more than a dozen Heisman Trophy winners and future NFL icons over the course of its illustrious history, giving fans a chance to get a glimpse of the stars of the future. Before moving into its current home at Hard Rock Stadium in the mid-1990s, the Orange Bowl was played for more than 50 years at the historic Orange Bowl just west of Little Havana. Leading up to the big game, fans and non-fans alike will be able to take part in a host of festivities around the city to get ready for the main event. The day before the game, the annual Coaches Luncheon held at the Hilton Miami Downtown will feature the head coaches and key players from both teams competing in the Orange Bowl. Kicking off the game day festivities on the stadium grounds is the Orange Bowl Fan Fest. All Orange Bowl ticket holders get in for free and can enjoy a lively atmosphere filled with interactive games, sports memorabilia, contests, food and drinks, marching bands and cheerleaders, and performances from some of the hottest entertainers today. Past performers include Phillip Phillips, Jake Owen and Lil Wayne. Fans sticking around in the days following the game can also enjoy all the New Year's Eve festivities Miami has to offer  including the iconic Big Orange Ball Drop at Bayfront Park. Hard Rock Stadium, which is also home to the Miami Dolphins, recently went through a sweeping modernization that elevates the game day experience for fans. The 65,000-seat stadium features an open-air canopy roof that protects most fans from rain, four state-of-the-art video boards and great views of the game no matter where you sit. To see the seating chart and purchase tickets, click here. Fans who plan on parking at Hard Rock Stadium for the Orange Bowl are encouraged to purchase a parking permit prior to game day and arrive several hours before kickoff to avoid traffic entering into the stadium. Before game day, Orange parking permits are being sold for $35 ($40 on game day) and Premium Blue parking permits for $50 (not available on game day). To see the parking pricing chart and purchase a parking permit, click here. Sign up for the Miami Insider enews to receive news, events and special offers. We'd love to see your photos! Share them with us on Facebook, Twitter or Instagram and don't forget to use the hashtag: #FoundInMiami.